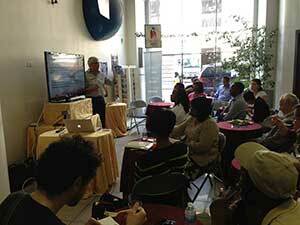 One hundred and fifty people attended the "Connect to Escape" lunch seminar in Manhattan's Midtown area. One hundred and fifty people attended the "Connect to Escape" lunch seminar in Manhattan's Midtown area, most of them business people working in the surrounding offices, to enjoy delicious vegetarian food and talk about current situations in the society. The objective of the seminar was to share the wisdom from the Ancient Book (Holy Bible) on how to deal with the challenges in society and our lives. This event was one of 160 evangelistic programs and community service events taking place across Greater New York during June 2013 as part of the NY13 Comprehensive Urban Evangelism (www.ny13.org). Dr. Miroslav Pujic, Director of Ministry to Postmoderns at the Trans-European Division, presented a six-part seminar, entitled "Connect to Escape", on June 11 – 13 and 18 – 20, 2013. This seminar was designed to reach those with a postmodern mindset. The program was conducted at lunchtime on weekdays so that those working in the nearby area could attend. The setting for the meetings consisted of a café-style atmosphere with a vegetarian lunch, relaxing background music and a lecture presented in an interactive way inviting audience participation. Other partners who made this event possible included active local church members and pastors who attended NY13 as delegates. They invited their friends who work in the Central business district to attend the meetings with them. Several pastors from the Southern-Asia Pacific Division invited people off the street and visited and prayed with them. (Read their experiences and get to know the team online at www.h4bc.com). In addition, the local Adventist Book Center provided sample vegetarian foods. As a result of his cooperative effort, the total attendance was 150 for the 6 sessions, with a total of 33 guests. Participants were presented with the practical benefits of applying Biblical principles into their lives and given tips on how to do this. Dr. Pujic reframed Biblical topics with a relational perspective, addressing relevant issues such as, “Is God doing His job?”, “How to escape corruption?”, “Struggle for survival. Why?”, “Should I forgive someone who hurt me?”, “The Greatest social need” and “End of the world. Really?”. "Connect to Escape" was held with the purpose of reaching young professionals who work in NYC. There are millions of people that live in the city and many of them commute for over an hour to get to work every day. “Offering an alternate outreach program during lunchtime gave us an opportunity to reach out to people that would be almost impossible to attract to evening meetings,” says Pastor Gerson Santos, Study Center Director for Urban Ministries at the General Conference, Adventist Mission Office and Executive Secretary for the GNYC. “The program proved to be very effective as New Yorkers returned on numerous occasions to attend 'Connect to Escape' during their lunch breaks. Our goal is to continue offering these programs on a monthly basis in order to increase our database of interests, expand our programs to the community, develop contacts for Bible studies and develop small group meetings in the area”, concludes Santos. 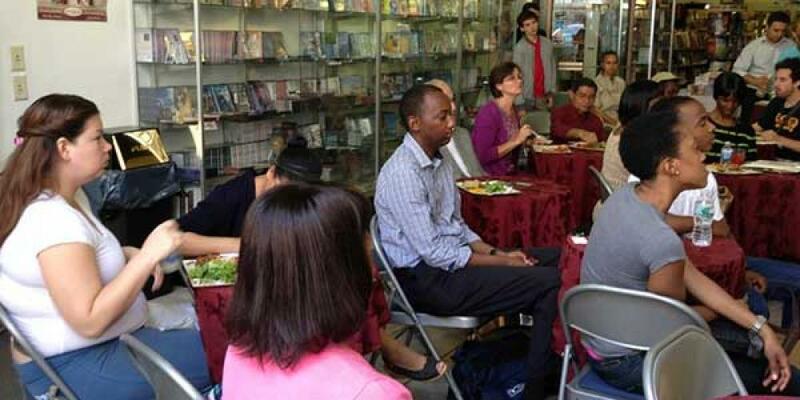 The "Life Hope Center" in Manhattan, NYC, is being established to connect with the community and to promote a holistic approach of personal, physical, emotional, social and spiritual development by offering seminars, resources and services. To connect to the "Life Hope Center" on Facebook, go to Life-Hope-Center-NYC.